Two massive Jupiter-like planets were recently discoveredorbiting around two extremely close sister stars ? an unexpected find, giventhe disturbing gravitational effects within most binary star systems thatusually disrupt planets from forming. The alienplanets were found to orbit around the binary star system NN Serpentis,which is located about 1,670 light-years from Earth. The more massive of the two stars is a very small whitedwarf ? the burnt-out remnant that is left over when a sun-like star dies. Thestar is 2.3 times the diameter of Earth, but has a temperature of more than89,500 degrees Fahrenheit (49,700 degrees Celsius) ? almost nine times hotterthan the surface of the sun. The other star in the pair is a larger but cooler star, witha mass only one-tenth that of the sun. The two stars are joined in a very tightmutual orbit. The resulting change in the brightness of the system actslike a highly precise clock. By monitoring the eclipses, the team ofastronomers was able to detect small changes in the timing caused by thegravitational pull of two planets orbiting the stellar pair and tugging themout of whack, altering the eclipse schedule. The larger planet in the system is about 5.9 times moremassive than Jupiter. It orbits the binary stars every 15.5 Earth years ata staggering distance of roughly 558 million miles. Closer in, the secondplanet orbits every the binary pair every 7.75 Earth years, and is about 1.6times more massive than Jupiter. An international team of astronomers detected the planetarysystem using a wide variety of observations taken over two decades from severalground-based telescopes. While the discovery of planets outside our solar system isbecoming more common, only a tiny fraction of these planets have been found toorbit stars which themselves are in binary or multiple systems. This is simplybecause in these systems, there is little room between the stars for planets toform. The two planets in NN Serpentis do not orbit very close tothe binary stars, but the doublestar system was not always as tight as it is now. Back when the presentwhite dwarf star was a normal star, twice as massive as the sun, the two starswere separated by a much greater distance ? such that the observable eclipseswould have happened about once every two years. When the more massive star ended its normal life of burninghydrogen in its core, it bloated itself into a red giant star and engulfed thesecond star in its diffuse outer envelope. The friction of the companion starmoving within the red giant's envelope eventually caused the red giant to lose75 percent of its mass. This left only the intensely hot core of the original star,and a relatively unscathed companion star that now orbits extremely close tothe newly created white dwarf. The turbulent change from a normal double star system to atight binary containing a hot white dwarf would have been even more dramaticfor any planets present beforehand: The 75 percent loss of the original star'smass would also equal a 75 percent loss in the star's gravitational force. This could easily result in the release of planets, sendingthem careening off into space. Or, it may simply have resulted in a dramaticchange in the planets' orbits. In a separate scenario, the planets around NN Serpentiscould have also been created only a million years ago, when large amounts ofgas and dust were cast off from the main star to form a more massive version ofa proto-planetary disk. From this material, planets might have formed. If thisis the case, then it is possible that these massive planets were, in fact, bornafter the death of the star that enabled their creation. The results of the study are published online in recentissue of the journal Astronomy & Astrophysics. 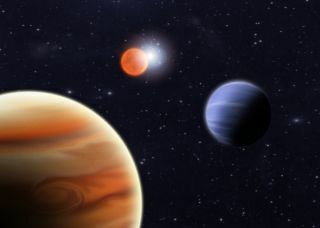 In a separate discovery, a Jupiter-sizedalien planet was recently found orbiting the star HR 7162, which is abinary star system located 49 light-years away, in the constellation Lyra.These recent findings are forcing astronomers to rethink their theories abouthow gas giant planets form.